EX- FOURSQUARE CHURCH G.O's WIFE DECLARES: "I WAS HAPPY BUT NOT EXCITED WHEN MY HUSBAND BECAME FOURSQUARE G.O"
Only those who have been up there, really know what it takes to be there! That is the story of Olayinka Badejo, the wife of the former General Overseer of Foursquare Church, Nigeria. She got into university exhibiting all the exuberances of youth, but the campus fellowship gave her a new conviction in Christ. 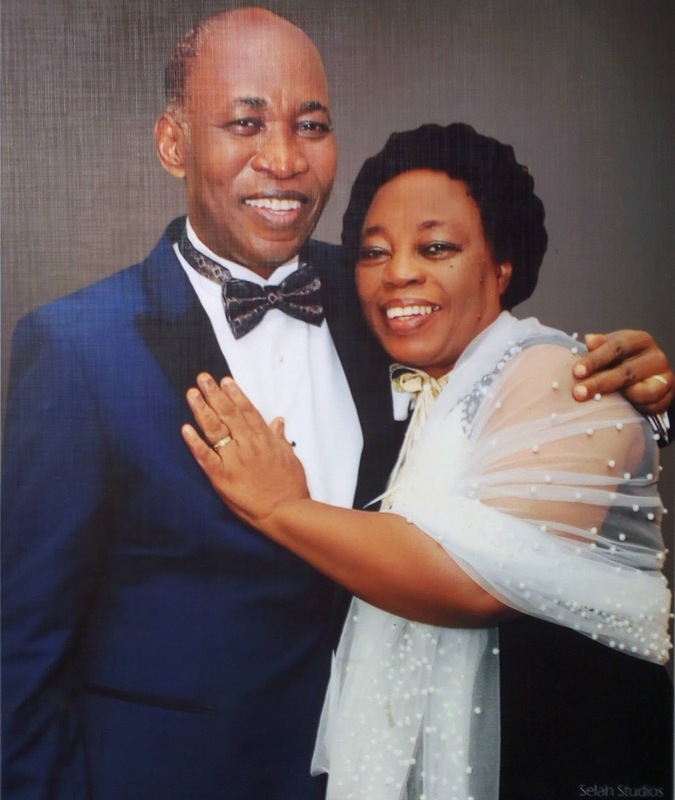 Despite availability of many suitors, she later married Badejo, one of the campus fellowship youth leaders. And they grew together until he became the General Overseer of the large Christian congregation that Foursquare is. 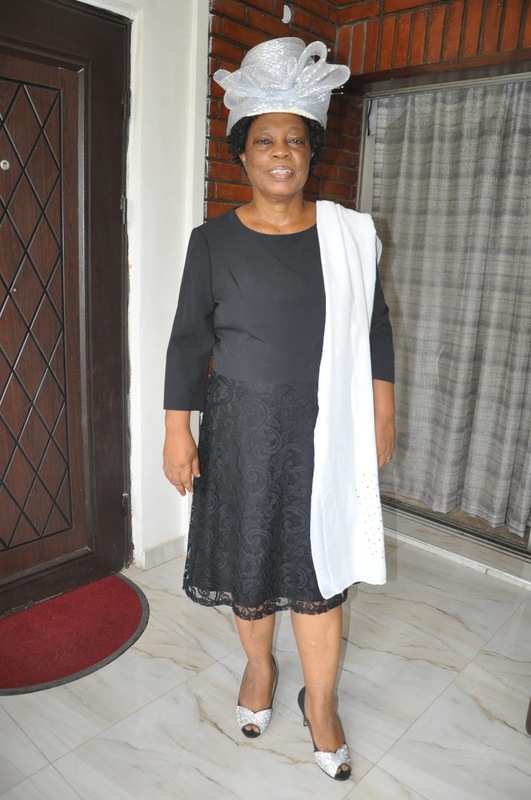 In this interview with Paul Ukpabio and Biodun Adeyewa, Olayinka Badejo who is now 69, shares with us the battle she has fought on her way to the top, her lifestyle as a psychadelic grandma, and memories of her uncle, Late Chief Bola Ige. How did your background influence the person that you are today? I come from a monogamous family. My parents were educated especially my dad Mr. George Adeleke Ige OFR. He retired as a super permanent secretary in the then ministry of works in 1977. So I was brought up in a home full of love. We were six in number, five girls and a boy. My mom trained us in such a way that each one of us could stand on his or her own. Concerning the household chores, she didn't spare us especially since almost all of us were girls. To us then, it was a hard training but it has paid off. It has helped me to face life. My father was an organist. My mother was a catering officer and she retired at the University of Lagos in 1983. I come from a background where both parents spoke in one voice. Whatever you heard from daddy, is what mommy too will say. Throughout my twenty six years with them, I never saw them quarrel once. They shielded us from the world. They brought us up in the Anglican Christian communion. Today five of us are in the ministry, two of us are ministers in Foursquare gospel church, one of us Dr. Mrs. Bankole lives in USA with her husband. They have a ministry. Another one is a pastor in Redeemed Christian Church of God and one has an independent ministry. The only brother who we have is a lawyer and he is involved with the Anglican Communion in Ibadan. Everybody is in church because daddy took us to church, at a very early age. Right from the age of six, he exposed me to church music. He would be on the organ and he would tell me to join him singing. He introduced me to music notes too. I have lived most of my life in Lagos. But we were brought up in Ibadan. We hail from Esa Oke in Osun state. My primary, secondary and university education was in Ibadan. My post-secondary education was at Olivet Baptist High School, Oyo. But as soon as I finished my university education, I moved to Lagos. I studied Information science. But in those days, it was called Librarianship. While did you choose that? It was actually my senior sister who is a Professor who encouraged me to toe that line. And immediately I came out of the university, I was employed by the then ministry of establishment and I worked in the federal ministry for 19 years. I retired in 1991 in Lagos here. You were already married by then? the school to the then headmaster. He was a faithful man. He still runs the school though the location of the school has changed. At the time you finished your secondary school education, brain-drain had started in the country. Did it occur to you to join the bandwagon to leave the country to sojourn in foreign land? I never had such an inkling because I had a secure home. I had a comfortable background. So I didn't even feel like leaving my home. I remember that when my senior sister Prof Mrs. Adun got married, the husband told her they were going to travel abroad. She refused, she told him she wasn't going to travel abroad with him. When my mom heard about it, she immediately called her and cautioned her that now that she is married, she will have to go to wherever her husband is going. That was the kind of mindset that we had. You stayed in Ibadan and you also stayed in Lagos, what was life like in Ibadan and then Lagos at that time? I was born 69 years ago. At the time I was growing up in Ibadan, we lived a communal life. Every child in the community, was seen as everybody's child. Even when your parents desired to travel, you didn't have to nurse fear of where to stay. That was unheard of! There as always somewhere to stay and people would willingly accept to have you stay with them. We enjoyed that communal life. Even when our parents decided to travel out in 1954, we were comfortable living with our grandmother. I was a teenager when my father was transfered to Lagos in 1965. So in between the school term and holiday, I was shuttling between Ibadan and Lagos. There was great difference between Ibadan and Lagos. Then the municipal transport system was working 24 hours in Lagos. The buses, Oshinowo, Benson transport were on and there was no fear of kidnappers. Lagos then was a safe place to live. But now, the population is overwhelming. Now that we have more people in Lagos, they are more doubtful characters and more vices now that were not here then. We met at the university. He was a youth leader in the varsity christian union. Both of us were in the choir. He had a sonorous voice, while I was singing soprano. At that time did you visualise in your mind him being a General Overseer in future? Not at all because my idea then was to marry a professional. But even then, at the time I got into the university, I wasn't looking out for such because I was already engaged. Also, at that time though I had met Christ, my legs were still shaking. I wasn't really matured in Christ yet. It was when I joined the campus fellowship that I then began to mature in Christ. I then had to cut off my relationship with the other person immediately the Lord ministered to me. Ironically, the man himself is now a pastor. What was the attraction to your husband at the Ibadan varsity? The attraction I had then was based on the Christian role he was playing. He was committed and he was one of the leaders. Having been there before us, he was more matured than those of us that just joined. We learnt that your husband was an activist back then? Yes, he was before he met Christ. But he had to stop all that when he met Christ. That's because, the Christianity that we knew then, is quite different from the Christianity as it is now. Being born again then was total, not the compromising christianity that we have these days. T he christianity that we have today produces people who are not really groomed but already heading ministries. But at that time if you were a Christian, you were indeed a Christian. No half measure. However today, there are half measure Christians even people I can refer to as one quarter christians. You mean Christianity of that period was different from what we have today? Yes, very different because then you could trust a christian. If someone came to you and said he or she is born again, you could take his or her word for it. You can actually go to bed with that. But not now. There has been a lot of watering down in the church from the leadership to the led. For you to know who is truly a christian now, you have to be close to the person and closely watch the person. The kind of christianity we practised then was total commitment. People were more serious about christianity and about being a Christian. Also the way we saw the gospel then, it was 'violently.' It was repent or perish! There was no half way, no half measure and we didn't apply motivational speeches to christianity as we have it now. The messages then was strictly straight, no half measures. What did your husband say was his attraction to you? According to him, he said the Lord led him and he took some time to pray and fast before coming to me. He had a friend then, an Ibo man, who was my husband's best man at our wedding. On his own, his friend, decided to pray and fast for 21 days to seek God's face as regard my relationship with my husband who was courting me then. At that time, there were many ladies who were running after him. He was quite intelligent, handsome and committed. Some of the girls took time to write to him. He told me about the letters and I knew some of the girls. So he had to make serious effort to find out who the Lord wanted for him. Were you worried about losing him? But were you initially sure that you would be the one he would propose to? Well, when we were on campus, he used to invite me to go with him for evangelism. Yes, I used to wonder why he usually invited only me. So one particular day when he invited me, I waited for him. That day, I applied make up, did my hair specially and was literally decked in gold earrings, bangles, all the works as regards ladies fashion. When he arrived and I appeared to him, he was dazed! So, I told him let us go. "Ha, Sister Yinka," he said and looked at me, shaking his head. "Not today, it is not convenient." Later he was to tell me that, 'you cannot dress like that, when you are not going for a party.' Then I used to love wearing gold. If there was no available space in my wrist and ear, i could put it on top of my head gear. But by the time he laid his card on the table, I had to agree with him that he had a point. Gradually I did away with gold and all those idols because they were really idols. Weren't you scared that you may not be able to keep a thorough Christian home being married to such a committed Christian? No, I wasn't scared. I was very confident because of the relationship we had and the background that we already had in the Christian community. Then, there was nothing like divorce. It was not heard of. And nobody mentioned it. So I had no fears. How was the challenge when you became the wife of the General Overseer of Foursquare Gospel Church? I was already a matured Christian. I knew when to talk and when to keep quiet. God helped me much in that area. I can quickly say here that throughout our tenure, I didn't quarrel with anybody because I know that those who live in glass houses, don't throw stones. How about the women ministry that was in your care? I was very much involved. I know that the women make or mar a ministry. If you can get good hold of the women, the ministry will have a good success. So I was involved. I didn't face much challenge because of the type of person I married. Once he gives you your limit, then better be there. So I knew where to stop and when to continue. The office was not just about interacting with your immediate christian community, you also had to interact with politicians and non-Christians. At that point how were you able to mix and blend? I was already a matured christian at the time that we got into the office. I was already almost 30 years in the Lord. We had to interact with people in government but I knew my boundary. And then also, most of the people we interacted with were good. Our relationship with Her Excellency Chief Mrs. Remi Tinubu and Her Excellency Dame Abimbola Fashola was good and they assisted us. We didn’t have problem with them. For those who came into the ministry, once we knew they were not mature Christians, we know the measurement we use for them. We found a way of getting them to Christ, not them pulling us away from Christ. It is an office that you give a lot to and then enjoy also, that’s if you are willing to pay the price. But if you are not willing to pay the price, your tenure will just whittle away like a snake that passes on a mountain and leaves no trail. But when you are there and you do all it takes to be in office, after you have gone, your testimonies will trail you because you have to put in a lot in terms of your comportment in terms of your character, in terms of your relationship with the media and the general public. Also in terms of attending fellowship and in terms of ministry work itself. Whether you like it or not, there will be lots of invitations and for each invitation you are meant to give them something that they can hold unto. So if you are paper weight, it will show. If you are middle weight or heavy weight, it will also show. What advice will you give to those aspiring to be there? To start with I will say, always have it at the back of your mind that any office is temporary. If you do not leave office, the office will leave you. Even if you are the founder, one day God will take you away. In any ministry there can’t be two general overseers, its only one and then under him so many men and women of God. So once there, you have to make up your mind to achieve the best because you are surrounded by people who can help you achieve your goals if you have goals. But some are just there, or aspire to get there just for the perk of office. It shouldn’t be. You must also remember that those you meet on your way up, you are likely to meet on your way down. So work on your relationship. Then you must know that you are the mother of all. The mother of witches, of wizards, the mother of strong Christians, the mother of weak Christians, the mother of dying Christians and the mother of dead Christians. You are in a position whereby you can easily decide their faith. So no matter how bad that member is, you still owe the person a responsibility. It's difficult because even those you are loving, they turn their back against you when you are not there. Nothing is new under the sun. This issue is strong, and you are in a good position to clarify on it. It is about fashion and the female Christian. Being a woman is about being beautiful. So what should fashion be or mean to an average female Christian. (Smiles) it depends on your perspective of fashion. If I qualify fashion to be dress sense, then there is a standard in the Bible and that standard is moderation. Its only when a Christian wants to deceive herself that she will say I can dress anyhow I like. If its that way, then the Bible won’t talk about it. If you look at ---- the passage says do not let your Christianity be an outward show, let it be inward. So inward christianity which reflects your inner mind, will show in your dressing. In those days you could tell who is a Christian, from the way they dress, talk and behave. Now you have a lot of worldliness creeping into christianity. When you talk of fashion, you know that even morally, there are things that women should not wear. Culturally there are things we shouldn’t be seen in. Western influence has taken away the core value of our dress sense too. Imagine you are entering a church and the usher receiving you is half dressed and all the things that are meant to be private are all outside! You know for the men it is what they see! Ti oju o ba ri irikuri ko ni di isekuse. When you are coming to the church, you can be fashionable. But watch what you wear! Are you going there to put a brother in trouble? Or are you going there to open that young convert to temptation. When you are fashionable, orchestrate your fashion in a godly way. Areas that are meant to be private, let them be well covered. It doesn’t take anything away from your being fashionable. How about the use of jewelry? There’s nothing in the Bible against the use of jewelry. All what the Bible says is moderation in anything you are doing. When I was in the world, I used so much jewelry that my neck used to suffer the weight. The jewelry on my ears will be dangling to meet those on my neck! All over my wrist would be bangles and when there is no more space, I fix on my hat. There was no way you will pass by me and not turn to look because even my skirts were cut low! But if truly you are born again, the old nature will give room to a new nature. It will show. Even if you are fashionable, we will see God in you. For some female Christians they still have a long way to go. May the Lord help them. I have a brother who told me he left a particular church because he wants to protect his Christianity. That he wants to make heaven. What fond memories do you have of your marital life? Many, because he has had lots of accolades. One was at his investiture by the Nigerian Institute of Veterinary Surgeons in Abuja. I was there with him and that was a high moment for me. The day he was named the General Overseer of Foursquare Church, I was happy but not excited because I could feel the responsibility that will come with the office! Already before that, we were hardly seeing him at home, so I found myself thinking what will it be like, now that they have made him a G.O. I remember what I told them at the headquarters then. I told them, 'I'm telling you people in public now, I will put for sale sign on his bed!’ Naturally I wasn’t a person who wanted to go public. I just wanted to be in my own corner doing what the Lord has directed me to do. Another memorable moment was when he was made an ambassador for the environment by the Lagos state government. And other memorable moments were when we sneaked into Sheraton hotel once in a while, to enjoy ourselves because we hardly had moments for ourselves. I love bright colors, yellow, red, bright green, blue. And when I wear dark colors, I combine with a bright color. Amala with ewedu and gbegiri. Once you were brought up in Ibadan like I was, that will likely be your best meal. How about your children and what’s life like as a grandmother? My kind of grandmother is different from the usual. I don’t have any children im raising here presently. All of them are abroad with their children. So I go there to visit them. When they have babies I go there, not to nurse but to share their joy with them. I told my children from the onset, that they should not blame me because I don’t know how to nurse babies. I had a mother in law who spoilt me in that area. Anytime I had a baby, she would come to stay with me to nurse the baby till the next pregnancy. She would take care of me and take care of my baby. So I don’t know anything about nursing a baby. For those who had children among them while in Nigeria, I got nurses for them and paid. I told them I’m not being wicked but I don’t know it. Were you close to the Late Chief Bola Ige? Haa, he was a family friend. When he was alive, he always looked for a way of bringing the whole clan together. Now we have a descendants union, he was the visioner. I lived with him as a teenager, in the same house. We would see on Monday morning and then on Sunday because by the time I would come back he was already gone and by the time he would come back, I was already in bed. But the little time we saw, we interacted well. I remember also much later, there was one of his friends who was making passes at me, and when he noticed, he shouted, “ha, ma je ki nri e nibe yen, that is a no-go area.” He said to his friend, “you cannot come under my roof to spoil this one.” I remember when he was governor and we were living at GRA. I was taking one of the children to a daycare center and he was on an entourage. He saw me walking down the road and he stopped the entourage to talk to his me his niece. He got down from the car, people were looking and probably asking themselves who I was to make the governor stop. But that showed how so much he cherished his family. He was intelligent, warm but a politician to the core.